RE has unveiled the Interceptor 650 at the on going motor show EICMA. The bike is powered by 648cc parallel twin air-oil cooled engine. The Interceptor 650 is featured with dual cradle frame with the rear loop, and twin exhaust etc. The suspension of this bike is developed for precise and immediate handling. The RE Interceptor 650 that is a proper Classic Roadster offers a relaxed, upright riding posture with the attributes like a raised handlebar, a flat brat seat and a forward-set-foot pegs. The retro-styled fuel tank with prominent Knee recesses and an adequate seat height of 804mm supplies aggressive riding dynamics. The handling of the Interceptor 650 is quite impressive as the bike is based on a rigid chassis that offers more stability at high speeds. The motorcycle crosses 100kmph from the standstill position quickly and can attain the top speed of 160 kmph. The suspension is at threshold not so plush as touring motorcycle and neither extremely stiff like a supersport motorcycle. The rear suspension is fully adjustable with five preload setting for varying the stiffness level as per the rider’s suite. At the powertrain, 2019 Interceptor 650 holds a brand new parallel twin engine. Although, it is an air-cooled motor but gets an oil cooling system which helps in cooling down the engine lubricant for better long run-performance. Mated to a six-speed gearbox, the mill is claimed to generate the maximum power of 47PS at 7,250 rpm along with a peak torque of 52Nm at 5,250. As the company claims the motor extracts 80 per cent of the torque at just 2,500 rpm. Royal Enfield Interceptor 650 ensures safety with the high-performance components like specially developed Pirelli tyres of measuring 100/90 front and 130/70 rear, dual disc brakes and ABS that enhances confidence while cornering even at the high speeds. 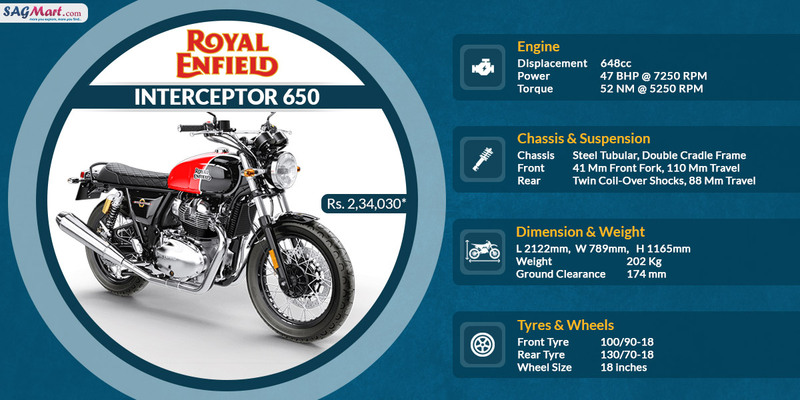 Royal Enfield Interceptor 650 is a fun-ride bike with an attractive price tag. In its most refined form, the 650 twins are here to full dreams of many big-bike enthusiasts. It is the prime competition for the others in the 650cc plus and twin-cylinder engine category. At my end, there is a big thumbs for this Royal Enfield's flagship motorcycle.